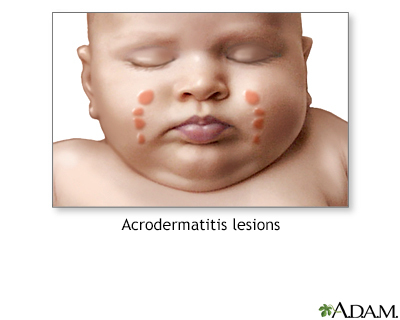 Acrodermatitis enteropathica is a skin condition peculiar to children that may be accompanied by mild symptoms of fever and malaise. It may also be associated with hepatitis B infection or other viral infections. The lesions appear as small coppery-red, flat-topped firm papules that appear in crops and sometime in long linear strings, often symmetric.